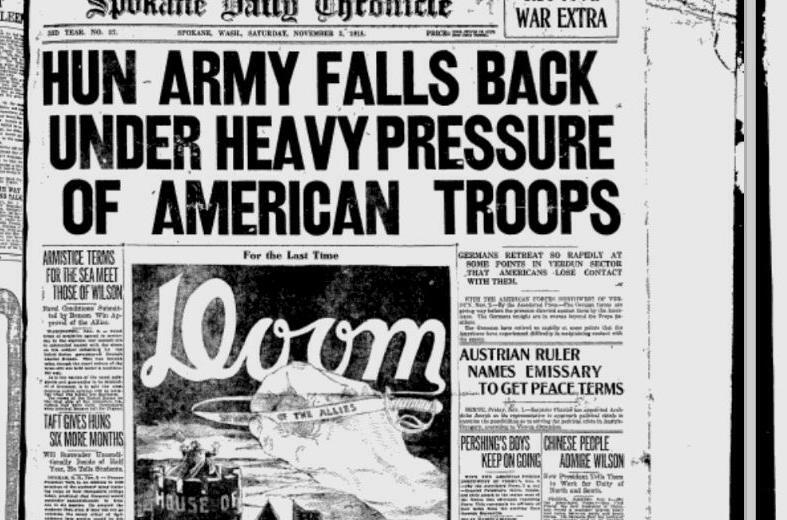 The Germans and Austrians were in retreat across the war front, but U.S. casualty reports were still pouring in. The parents of Spokane soldier Lewis G. Maskery learned the terrible news by telegram. Their son had died from wounds received in battle. Maskery had attended Northwestern Business College in Spokane and had been employed by Massi Candy Co. In April, he joined the Army and was sent to Camp Lewis in Western Washington. From there, he was sent to Liverpool, England. In his most recent letter home, he said he was not yet at the front. Soon after, his machine gun battalion was apparently sent into battle. Another Spokane soldier died from an increasingly common reason. William McMurray died of pneumonia (probably brought on by the Spanish flu) in a San Diego military hospital. He based this on the fact that the number of new cases had dropped for three straight days. Only 65 new cases were reported on the most recent day.